Teen movies are, at their core, veiled studies in evolutionary biology, with young men and women coming to sexual maturity and either giving into or resisting what is arguably an animal’s sole purpose on this planet — to find a mate. Some decide to wait until they’re married, others lack the desirable traits to even get that far, and still others succeed and consequently have to put off college for a while. But if the deep-sea anglerfish happened to have the cognitive and physical capabilities required to produce its own such films, there’d be decidedly fewer plot twists. Every single movie would go a little something like this: Boy meets girl, boy bites girl, boy’s mouth fuses to girl’s body, boy lives the rest of his life attached to girl sharing her blood and supplying her with sperm. Ah, a tale as old as time. A rare hairy anglerfish that entered the Museum's collections 13 years ago had perplexed researchers with its massive stomach. However, the specimen was so rare they didn't want to cut it open to identify its last meal. Now, using micro-CT scanners, the Museum's imaging experts have finally been able to solve the mystery. The over 300 extremely varied species of anglerfishes inhabit everything from shallow to super-deep waters, and are so named because they are fish that fish for fish using lures, which are actually highly modified spines of dorsal fins that have migrated to their snouts. But among the 160 deep-sea species, only some 25 engage in the aforementioned biting-fusing-mating, what is known as sexual parasitism. In this group, the diminutive male looks like an entirely different species, lacking the female’s enormous jaws and characteristic lure. This is because he doesn’t need to hunt. He only exists to attach to a female, and according to evolutionary biologist Theodore W. Pietsch of the University of Washington, mates are so scarce down here that it might be that only 1 percent of males ever find a female. The rest starve to death as virgins — unfortunate guys in a sea that doesn’t have plenty of other fish. But it isn’t for lack of trying. The male has the biggest nostrils in proportion to its head of any animal on Earth, according to Pietsch. These sniffers are paired with extremely well-developed eyes, “so we think that it’s kind of a dual approach,” he said. And with two dozen other species of anglerfishes that engage in this manner of reproduction, the male had better be damn sure he chooses the right one. Luckily, the female puts on the red blue light — in the form of glowing bacteria living in her lure. Incredibly, some 90 percent of species in the deep utilize such bioluminescence. “The bait out there is not only an organ of luminescence, but structurally it’s species-specific,” said Pietsch. Once the male closes in, he bites onto the female, usually her belly, and their tissues fuse together to permanently join the pair in incredibly unholy matrimony. The male’s eyes and fins atrophy away, and here he will live out the rest of his life nourished by her blood, still breathing with his own gills and, importantly, still producing sperm. “This establishes a hormonal connection,” said Pietsch, “so that probably the maturation of eggs and sperm is synchronized by the sharing of hormones. And once the eggs are mature and the male is ready, she extrudes the eggs” in a kind of gelatinous sheath that can be 30 feet long. This acts like a sponge, readily absorbing the water that the male has released his sperm into. Keep in mind that this is happening several miles down, where there is little plankton for juvenile fish to eat. So the whole gelatinous mess is buoyant, slowly making its way to the surface, where the larvae hatch and feed, ideally growing big and then migrating down to the depths. The females of these species can live 30 years, according to Pietsch, and over that time might collect several males, who provide sperm season after season after season (there is no “not now, honey, I have a headache” with anglerfishes). But other than the security of maintaining a constant source of sperm, why evolve such a complex ritual of reproduction in the first place? “The idea is basically that it’s a deep-sea economy measure,” ichthyologist James Maclaine of London’s Natural History Museum wrote in an email to WIRED. 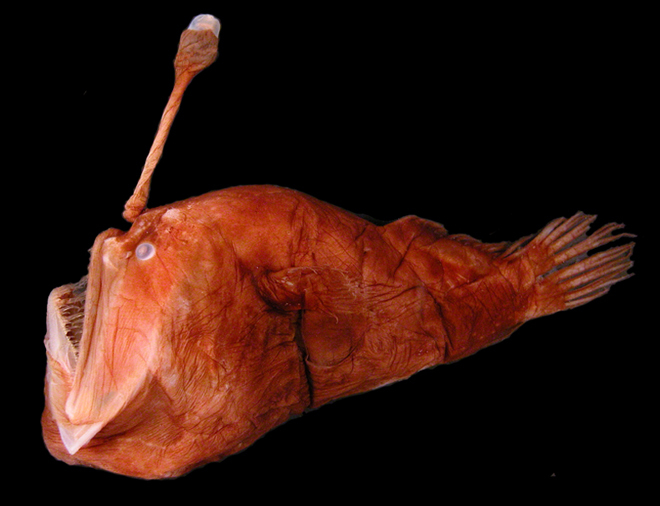 “An anglerfish couple requires about half of the amount of food they would if the male was the same size as the female (and presumably living an unattached life). Where such a size difference between sexes, known as sexual dimorphism, gets really interesting is its manifestation in the world at large. The famed evolutionary biologist Stephen Jay Gould wrote about this in his essay “Big Fish, Little Fish” — which stars the anglerfishes, of course — arguing that in the majority of animal species, females are larger than males, because the latter often never need to fight for the former. For creatures like lions and gorillas and even humans, the largest male has an obvious advantage in the quest to mate (and therefore better odds at passing along his genes). But with deep-sea anglerfishes, the male not only doesn’t fight other males, he’s lucky to even find a female in the first place. Hence their puny size and remarkable mode of reproduction. “At the depths at which many deep-sea anglers live … food rapidly becomes more scarce the deeper you go,” said Maclaine. 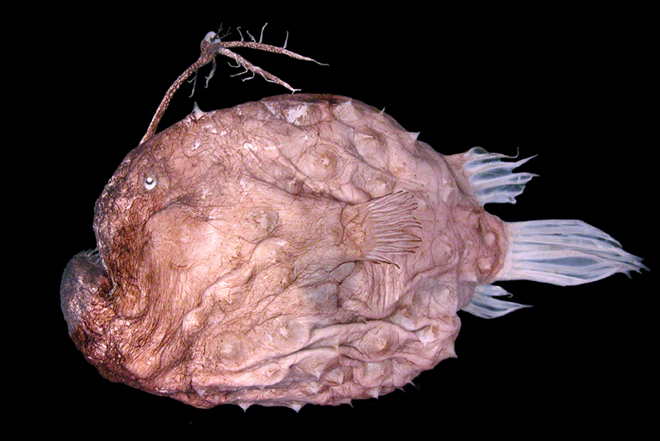 In fact, many female deep-sea anglerfishes can swallow prey twice their size, as Maclaine shows in the video above. They are, after all, sometimes eating for several freeloading males.